The 2018 Miss Boone County Fair and Little Miss tell Santa what they want for Christmas at the Poplar Grove Tree Lighting ceremony. The annual tree lighting ceremony is the official kick-off for the holiday season in Poplar Grove. Last year the event moved from the Village Hall to the pavilion on Main St. The pavilion was comfortably filled with attendees and more were lined up to enjoy the carriage ride. The sides of the open pavilion were covered to protect guests from any wind and heaters were placed inside to keep everyone comfortable no matter what the weather. Elected and appointed officials from across Boone County were present to enjoy the celebration, including Belvidere Mayor Mike Chamberlain and Boone County Treasurer Curt Newport, Poplar Grove trustees and more. Guests for the evening were treated to fresh apple cider and apple cider donuts, hot chocolate, cookies, and popcorn. Santa Claus brought a light dusting of snow for his sleigh as he came to visit. 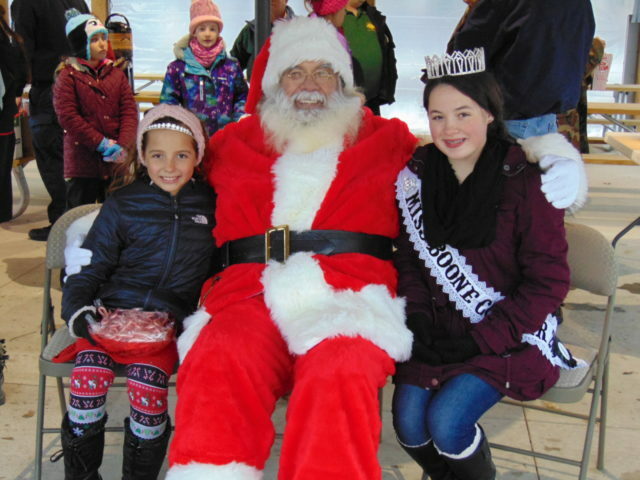 Miss Boone County 2018 Katrina Danielle Graham and Little Miss Boone County Annabella Grace Torres treated residents and guests with candy canes. A horse-drawn carriage ride ran from Main St….